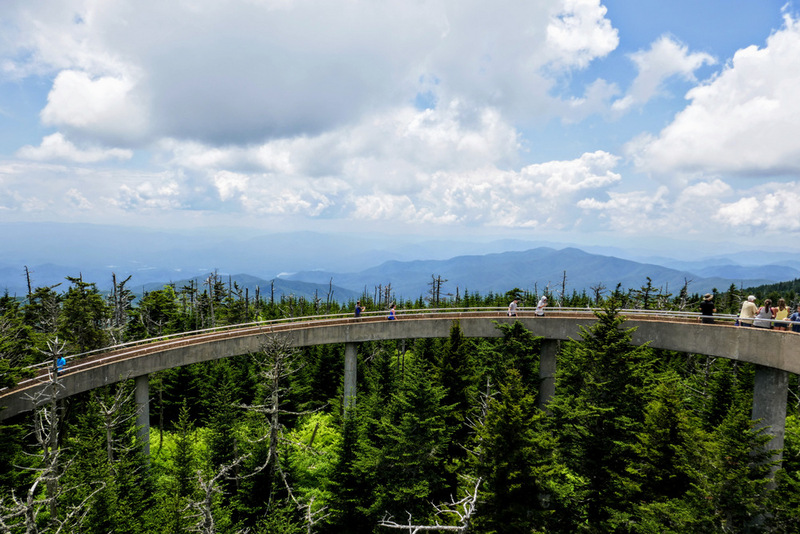 Clingmans Dome, one of the most popular landmarks in Great Smoky Mountains National Park, is the highest peak in the Smokies and the 3rd highest peak east of the Mississippi River. 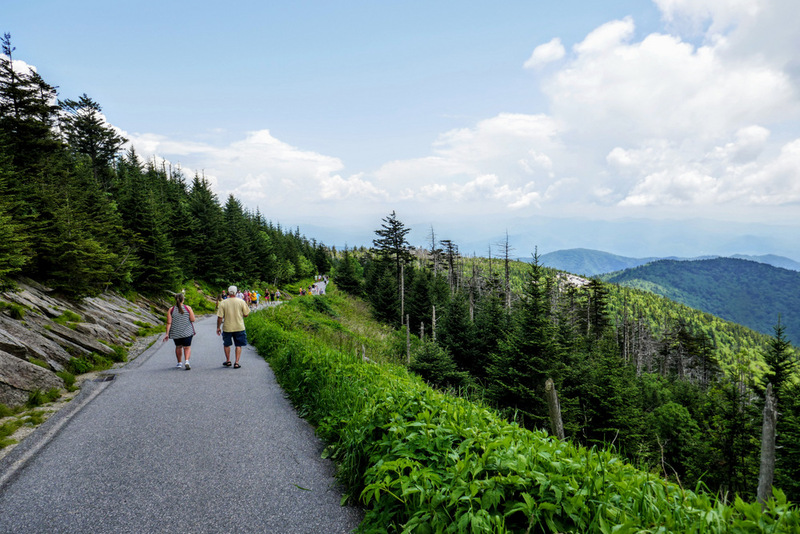 The easiest way to reach the summit is by driving to the Clingmans Dome Visitors Center and hike a half-mile to the summit. 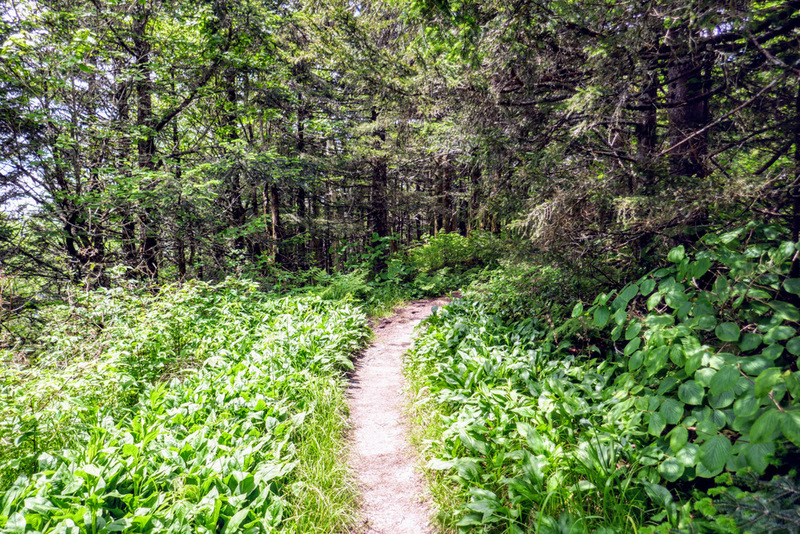 For those inclined towards longer hikes and more solitude, this is the perfect marriage of manageable day hike and a quiet walk in the woods. 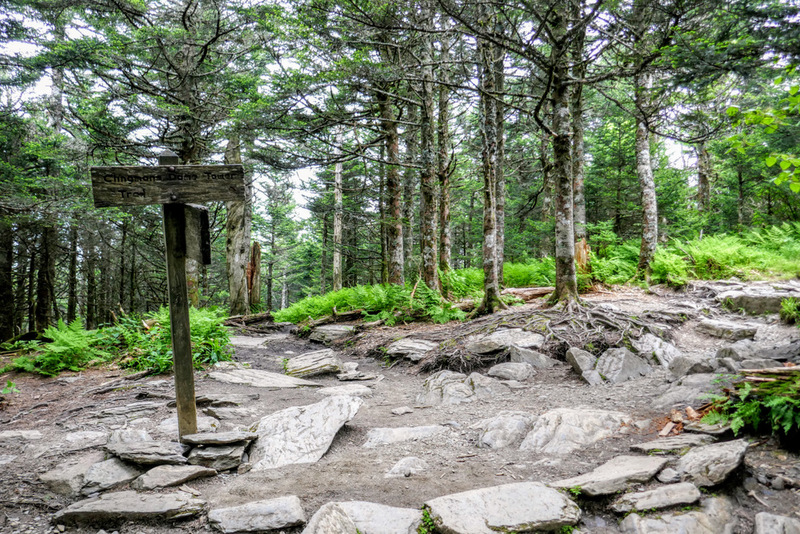 Beginning at the Fork Ridge Trailhead on Clingmans Dome Access Rd, you’ll follow the Appalachian Trail and Mountains-to-Sea Trail up and over Mount Collins and then gradually climb to the highest peak in the Great Smoky Mountains. 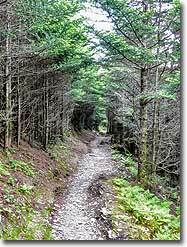 This is one of the highest elevation sections of the Appalachian Trail, passing through beautiful southern Appalachian spruce-fir forest. 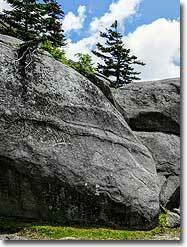 The climbs are never steep, you’ll stay above 5,700 feet for the entire hike. Once you’re at the summit you’ll be greeted by hundreds of hikers who choose the easier way by driving to the visitors center. 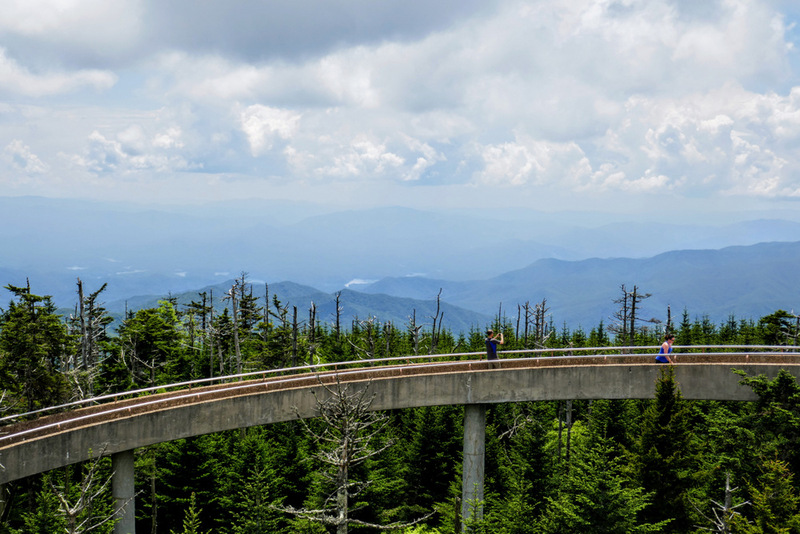 Despite the traffic, the views from the unusual Clingmans Dome observation tower are spectacular on a clear day. This hike also loops you down to the visitors center around the west side of the summit before returning to the original trailhead. 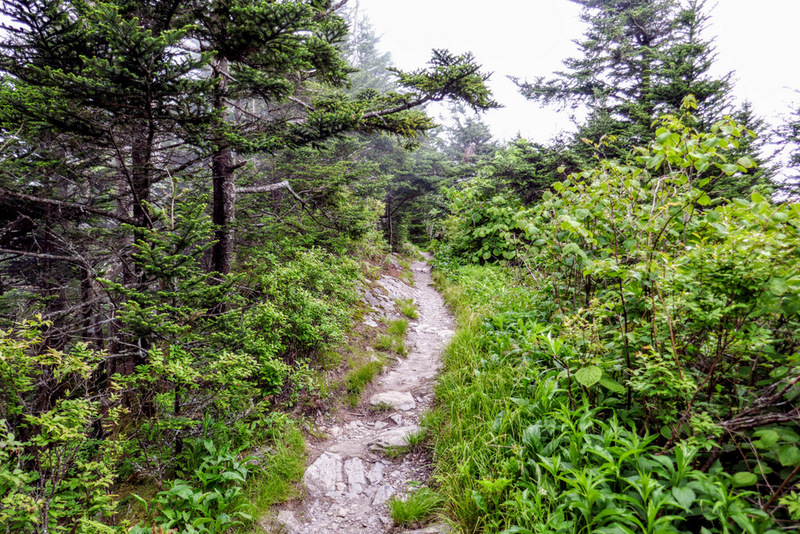 There are multiple ways to shorten this hike, but at 9 miles this is a moderate summit push compared to other southeastern Appalachian hikes to 6,000-foot peaks. 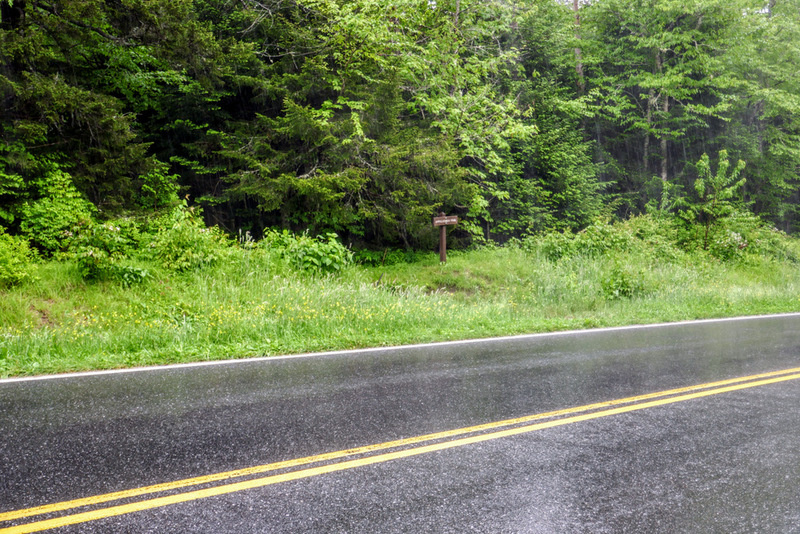 Seasonal Road Closures – Clingmans Dome Access Rd is closed from December 1 to March 31. 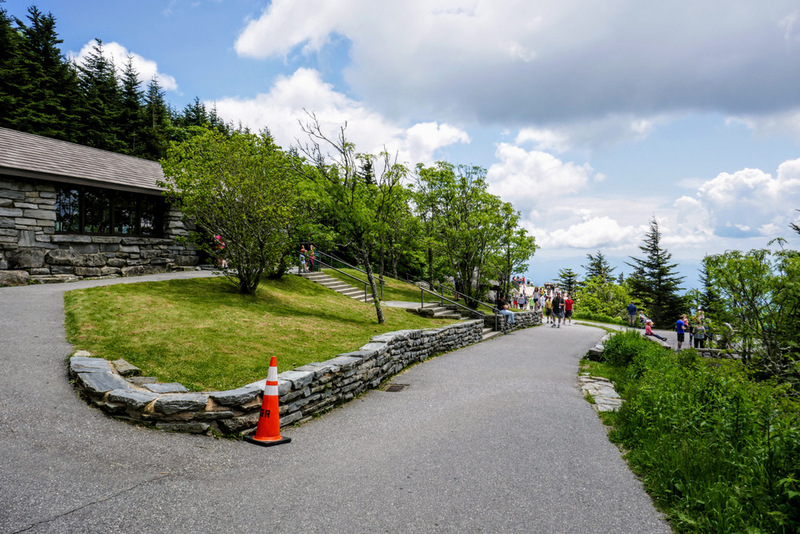 During these months the road is gated at Newfound Gap and you will not be able to access the trailhead. 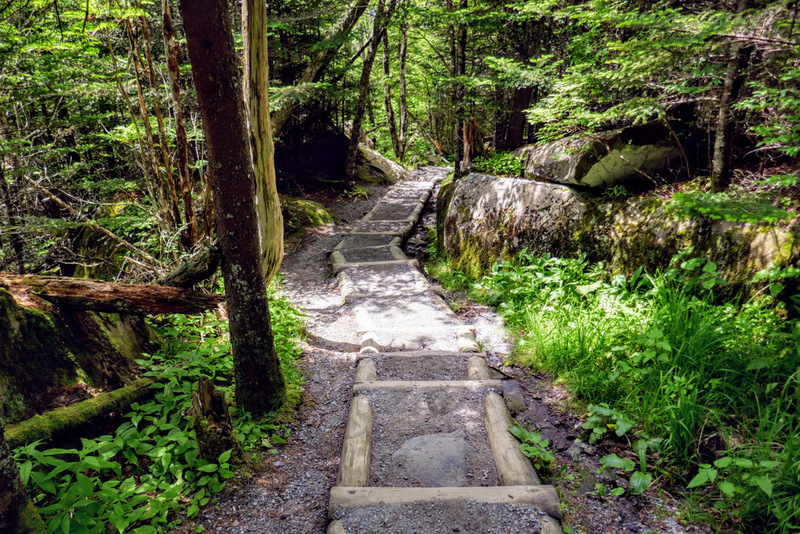 As an alternative you can park at Newfound Gap and hike the Appalachian Trail, which is a considerably longer and tougher day hike, especially with shorter winter days. If you do this it may make more sense as a backpacking trip. 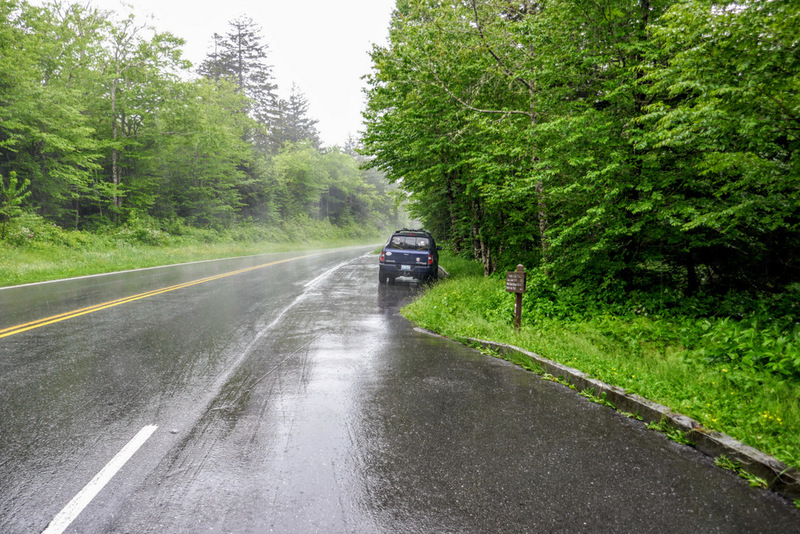 With bad weather Clingmans Dome Access Rd is subject to closures any time of year, so you should check the park closure website after heavy rain or snowfall. 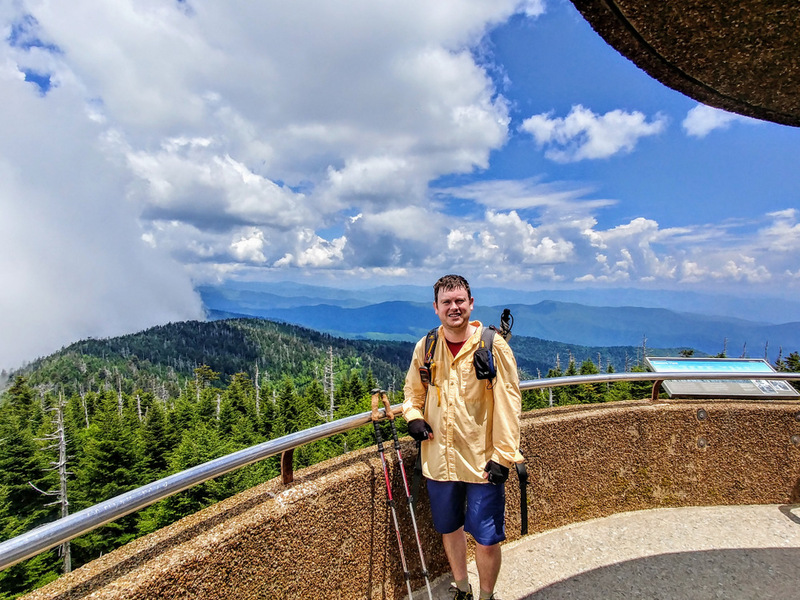 Alternate Shorter Hike – You can do a shorter version of this hike by parking at the Collins Gap Overlook and walking 500 feet north on Clingmans Dome Access Rd to meet the Appalachian Trail at Mile 1.6. This hike would be 6.2 miles total. 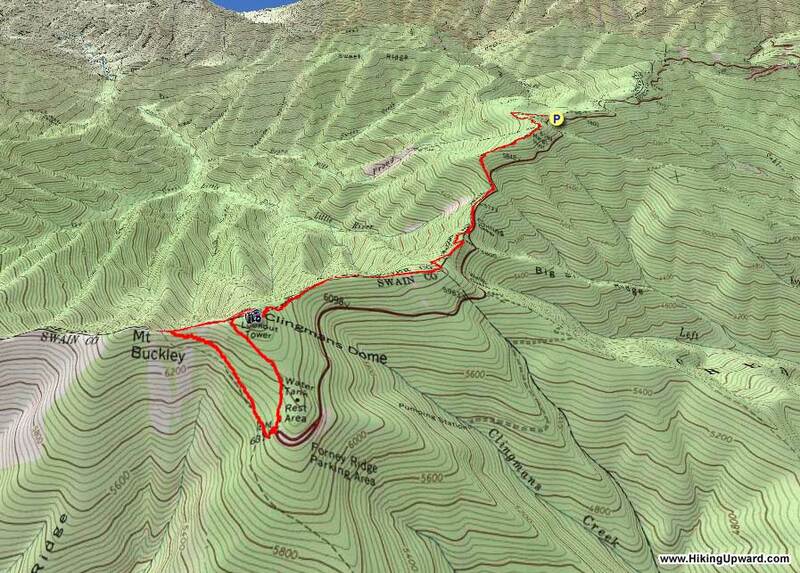 Mile 0.0 – There are two shoulder parking areas at the Fork Ridge and Mountains-to-Sea Trailheads. 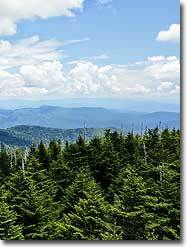 Both wide shoulders are located on the south side of Clingmans Dome Access Rd. 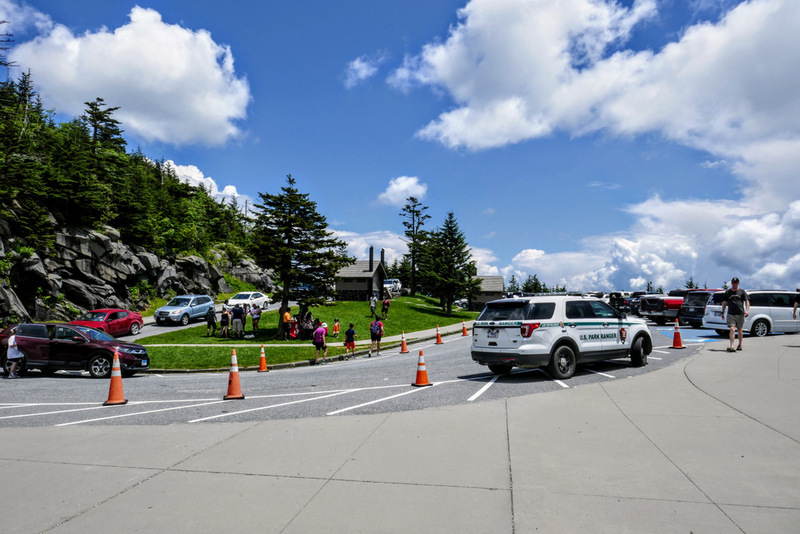 It would be easier to park and pull out if you continue past the trailhead and turn around at the Collins Gap Overlook. 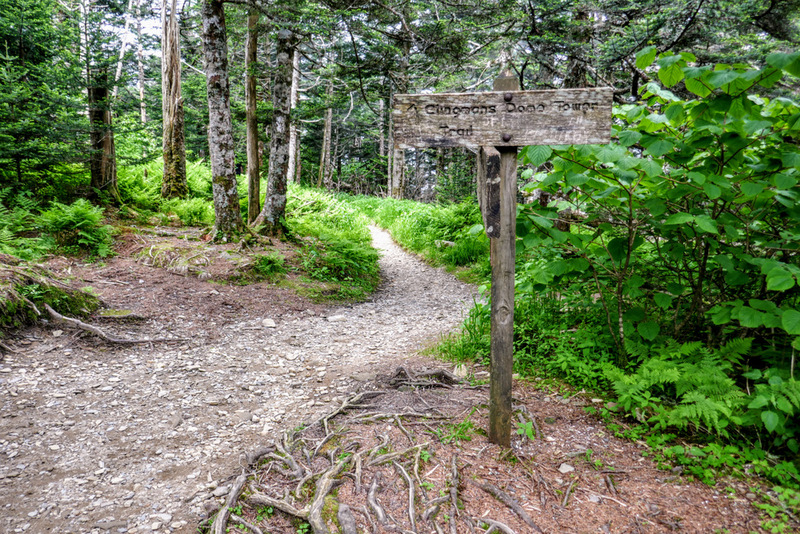 Once you’ve parked, cross the road to pick up the Mountains-to-Sea Trail (MST) to meet the Appalachian Trail. Mile 0.05 – The MST meets the Appalachian Trail (AT). 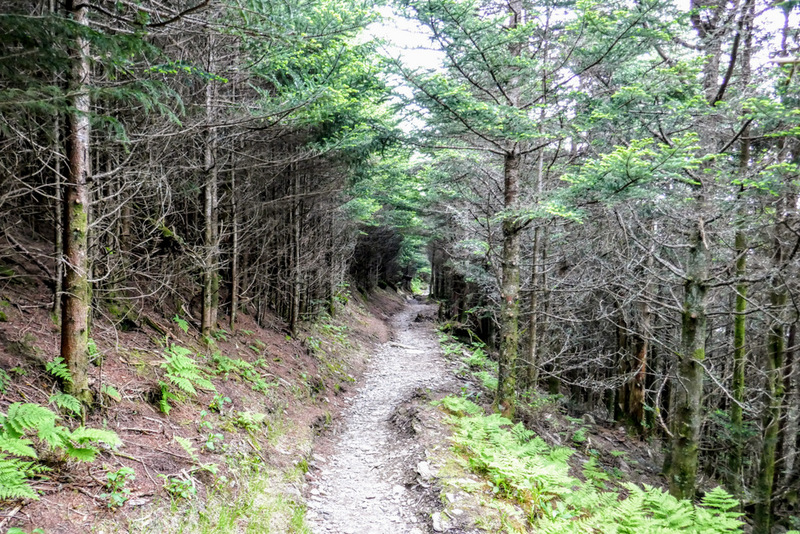 Turn left following the AT and MST southwest (white blaze) through beautiful southern Appalachian spruce-fir forest. 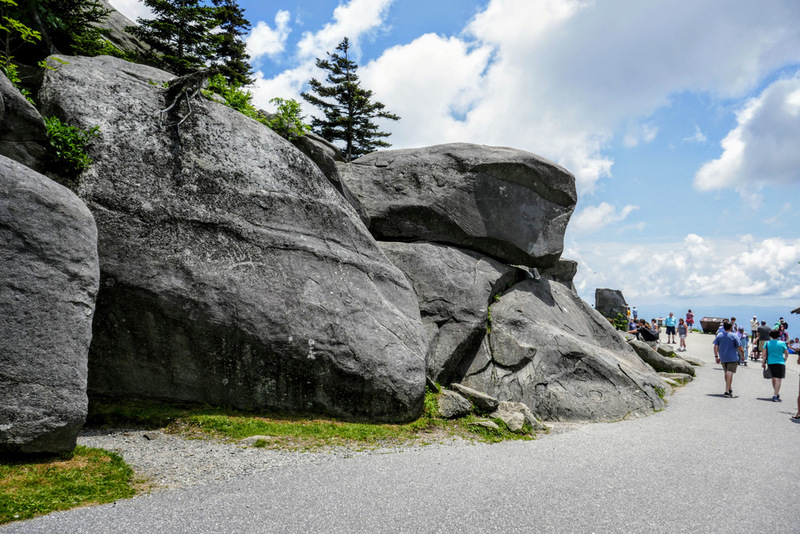 The AT mostly follows the border of North Carolina and Tennessee through the national park. Mile 0.35 – T-junction with the Sugarland Mountain Trail on the right. From here it is 0.5-mi to the Mount Collins Shelter. The trail then climbs in earnest towards the summit of Mount Collins. 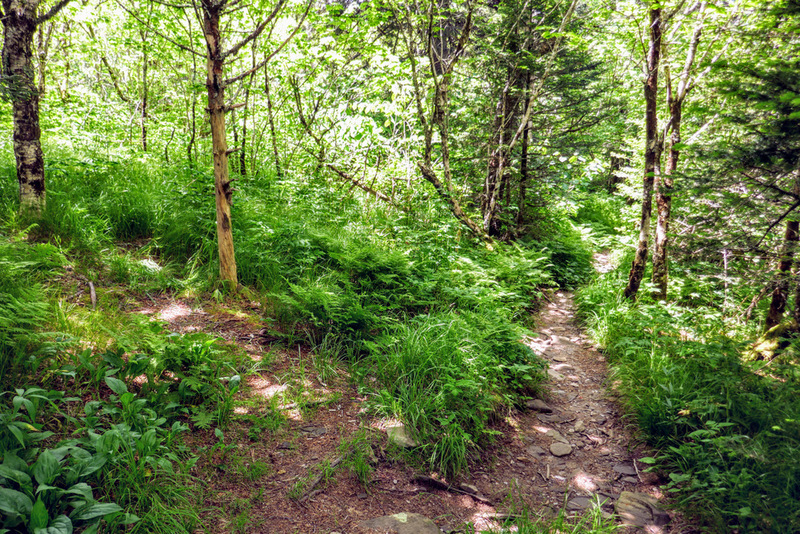 Mile 0.7 – Walk through a small clearing beside the summit of Mount Collins (6,196 feet). For peakbaggers, the true summit is located just off the right side of the trail. This is one of the 40 summits on the South Beyond 6000 Challenge list and is the 8th highest peak in the Great Smoky Mountains. 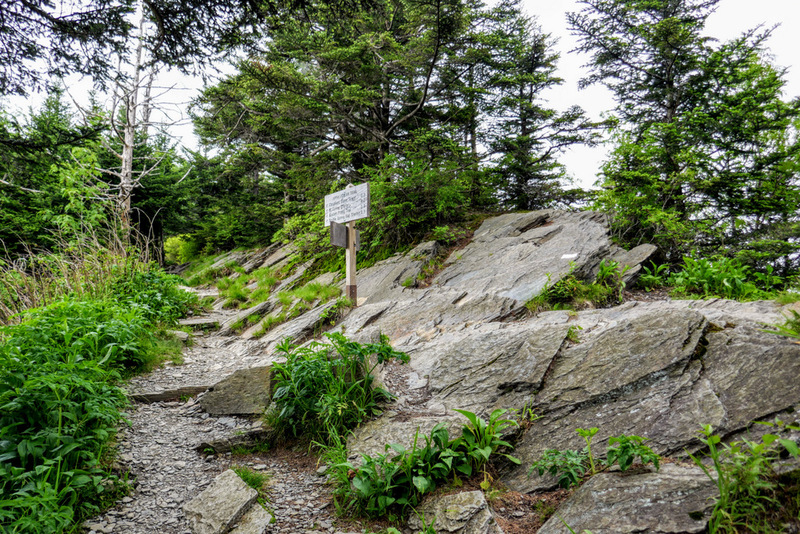 Mile 1.6 – On the left a short path leads to Clingmans Dome Access Rd. 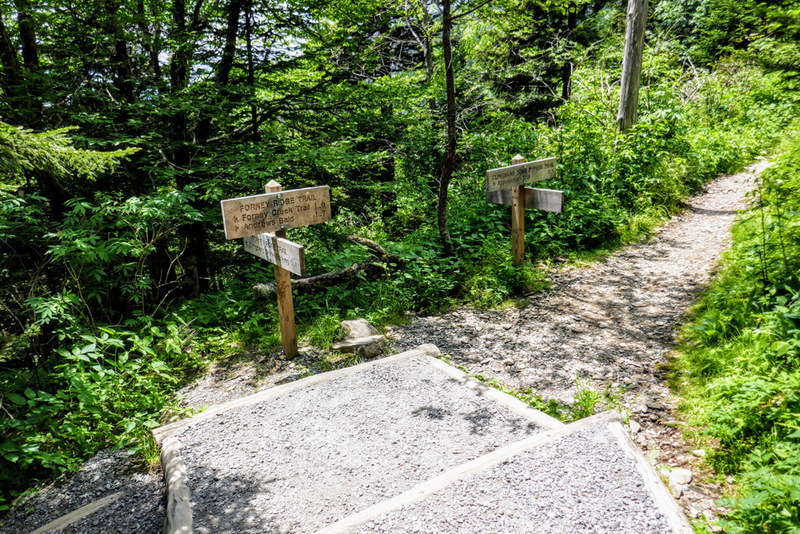 (If you opted for a shorter version of this hike, you would walk 500 feet from the Collins Gap Overlook to this connector.) 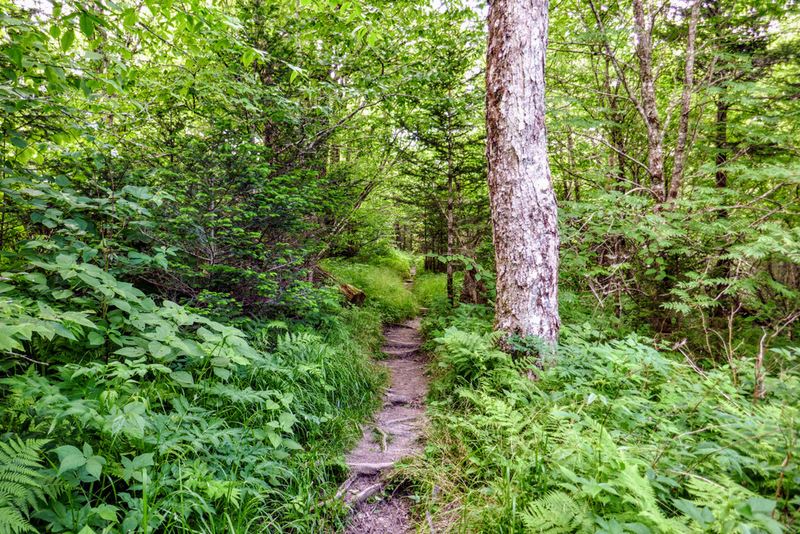 The Appalachian Trail levels out through Collins Gap, the low point of this hike below 5,800 feet. 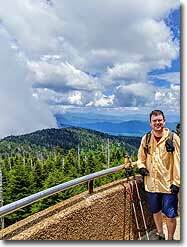 Over the next 2 miles the AT/MST gradually climbs ~900 feet towards Clingmans Dome. Mile 3.6 – T-junction with a short connector to Clingmans Dome on the left. 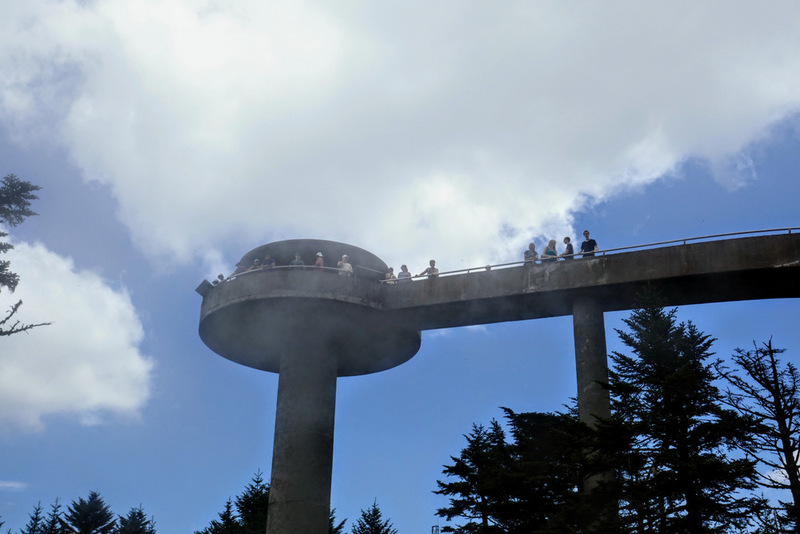 You’ll meet the paved walkway at the base of the Clingmans Dome observation tower. 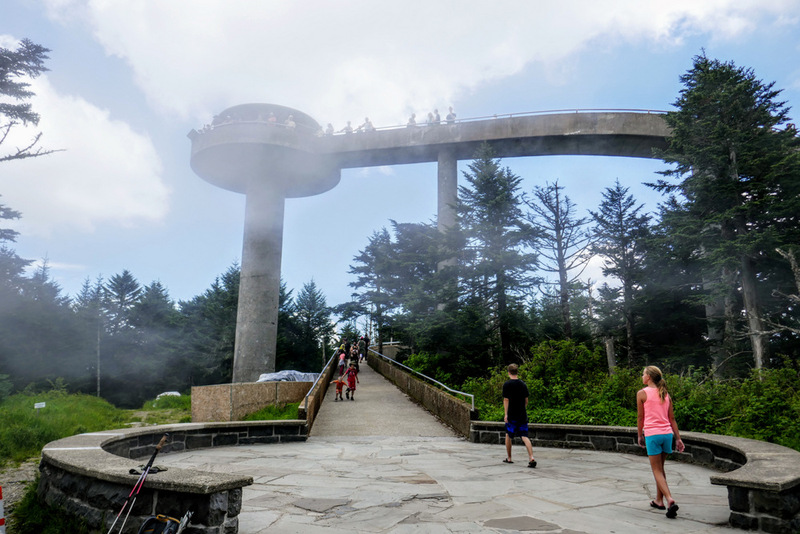 For the first time you will also encounter the crowds of casual hikers crawling up the Clingmans Dome Trail from the Clingmans Dome Visitors Center. The current iteration of the tower was originally built in 1959 and recently rehabilitated in 2018. Standing 45 feet above the ground, the tower is reached by a 375-foot ramp with a 12 percent grade. The tower is one of the most unusual towers in the region with its circular roof, giving the appearance of a small UFO. Mile 3.7 – Reach the top of the surprisingly small observation tower, which is only 28 feet in diameter. You may have to elbow your way to the edge to get views on weekends. 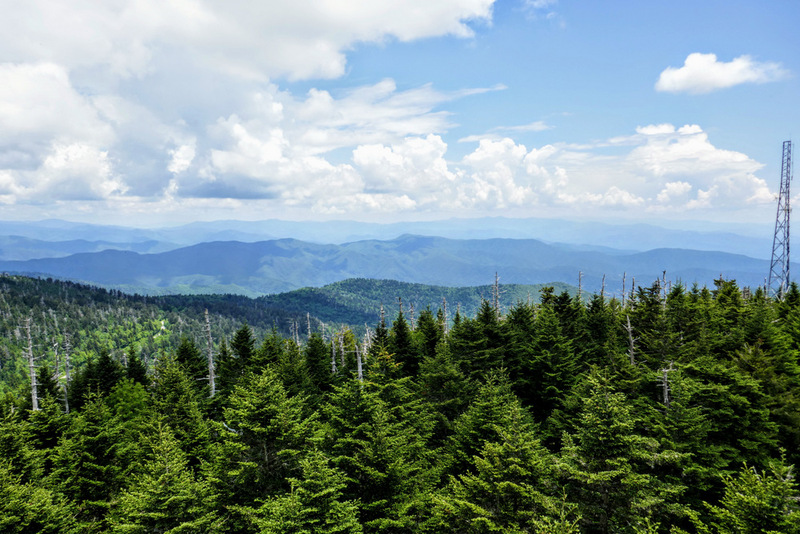 Clingmans Dome (6,643 feet) is the highest peak in the Great Smoky Mountains and Tennessee, and the 3rd highest peak in the East. 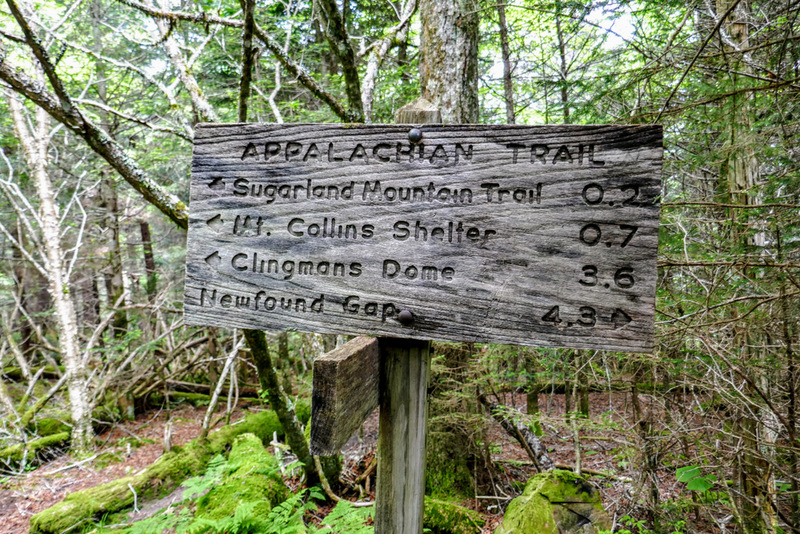 This is the western terminus for the Mountains-to-Sea Trail, and also the highest elevation the Appalachian Trail crosses on its entire course. 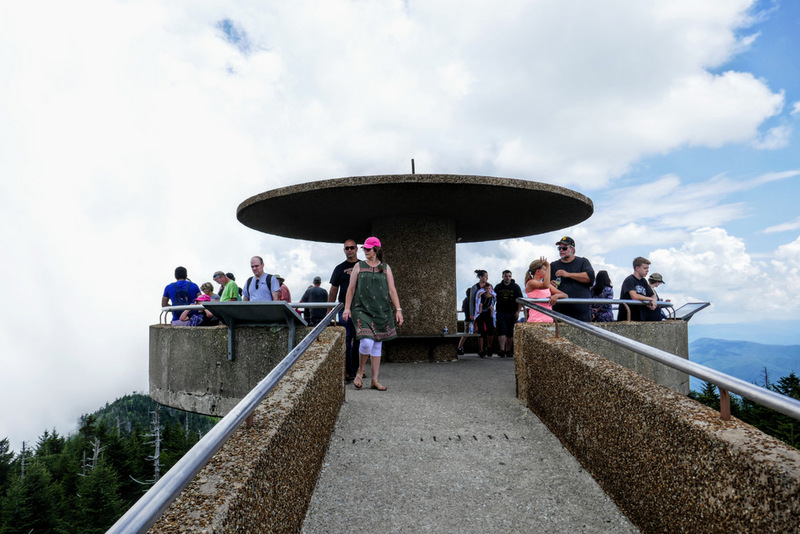 From the tower you’ll have 360° views on a clear day, which are notoriously hard to come by in the high peaks of the Smokies. Informative signs are fixed to the tower perimeter pointing out landmarks in every direction. Towards the north-northeast is Mount Collins, which blocks the deep notch of Newfound Gap. Beyond the gap are Mount Kephart and the dominant profile of Mount LeConte. Much further to the northeast the two largest peaks are Mount Chapman and Mount Guyot. In the eastern foreground are the high ridges of Noland Divide and Thomas Divide surrounding the Deep Creek watershed. Fontana Lake sits southwest thousands of feet below the summit. 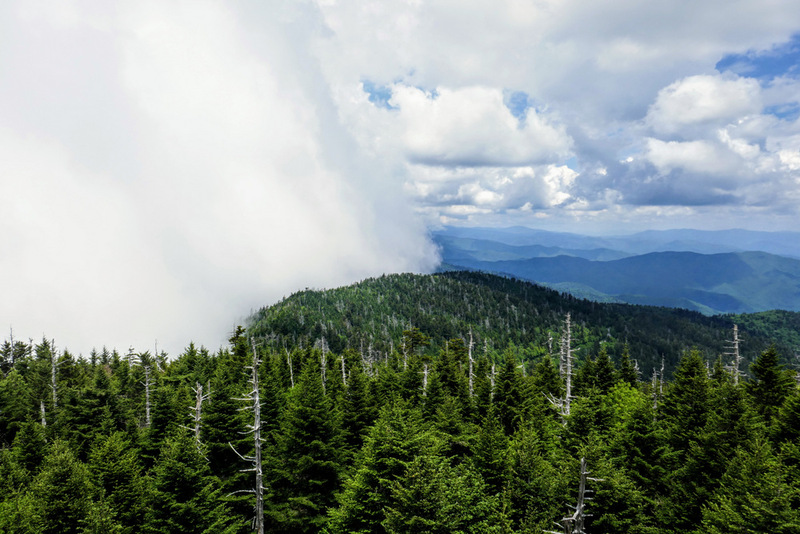 Thunderhead Mountain is the highest peak in the western Smokies, over 1,000 feet lower in elevation than Clingmans Dome. Mile 3.8 – Back at the base of the tower you have the option of turning around for a 7.5-mile hike. 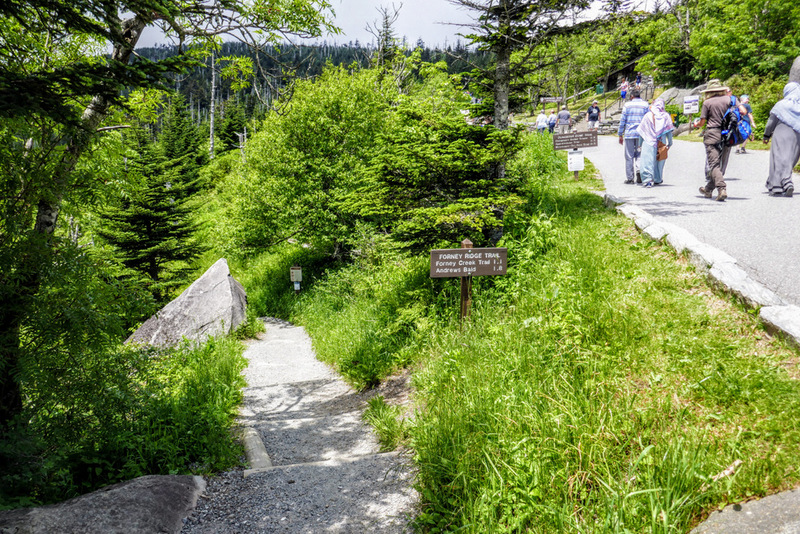 For this trip follow the paved Clingmans Dome Trail south towards the Clingmans Dome Visitors Center. Mile 3.9 – Junction with a short connector to the AT on the right. 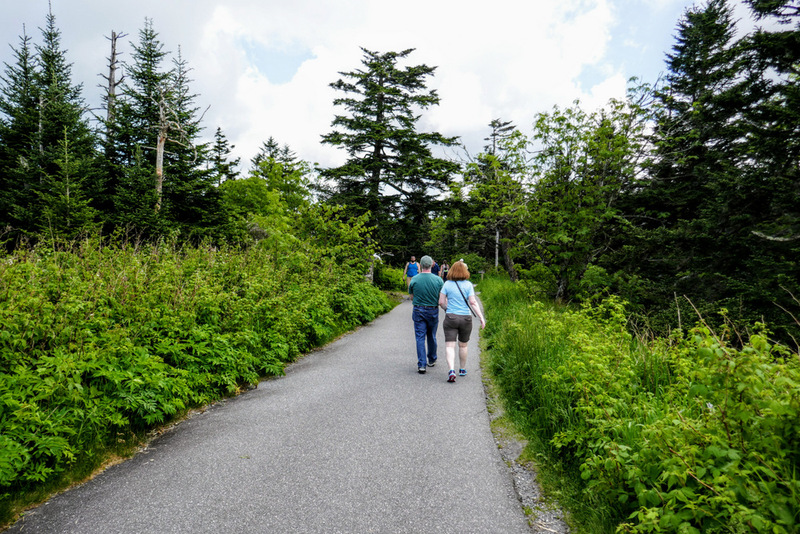 The Clingmans Dome Trail is paved but surprisingly steep from the parking lot. There are good views to the south and west as you descend. 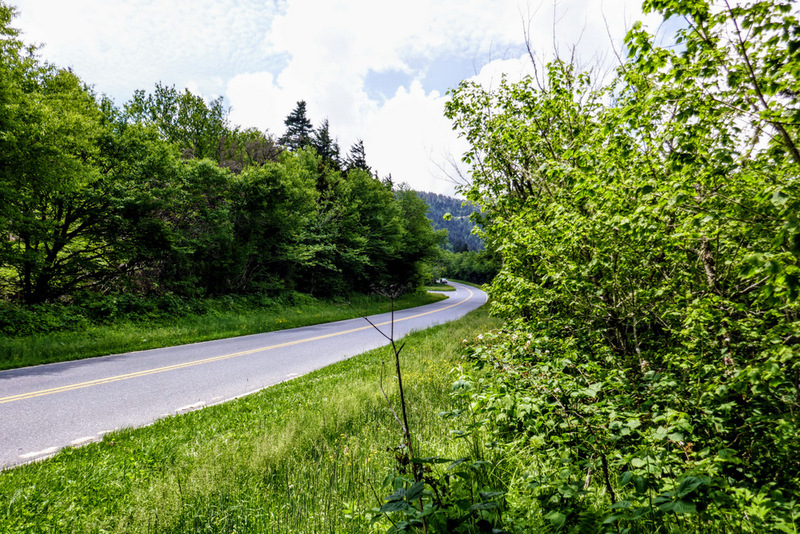 Mile 4.4 – Pass by the Clingmans Dome Visitors Center. This is a glorified gift shop and features few amenities compared to other visitors centers in the park. On our visit the only consumables they sold were warm bottled water and a snack cup, so do not treat this as a nice fuel stop. 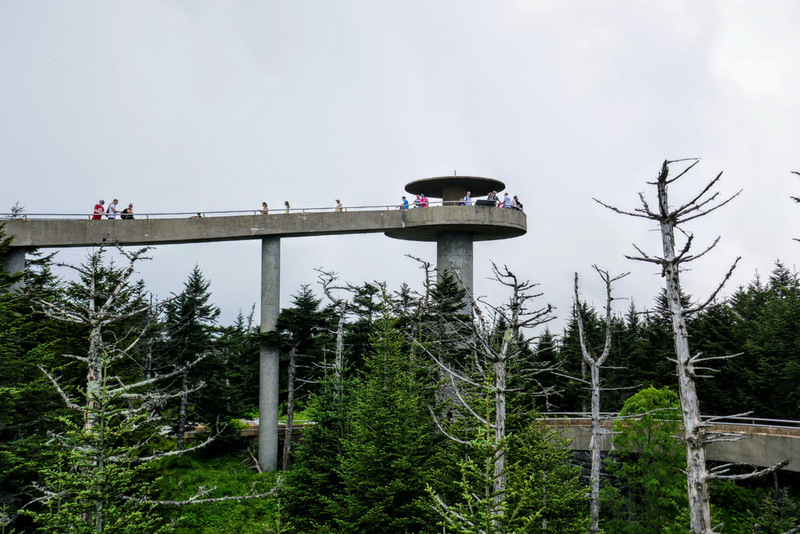 The Clingmans Dome Trail then ends at the parking lot for the Clingmans Dome Visitors Center and the Forney Ridge Overlook. Beside the parking lot are very impressive boulders. Locate and follow the Forney Ridge Trail on the west side of the parking lot. Mile 4.55 – At the T-junction the Forney Ridge Trail turns left. Turn right following the Clingmans Dome Bypass Trail. You’ll ascend through nice corridors of southern Appalachian spruce-fir forest. 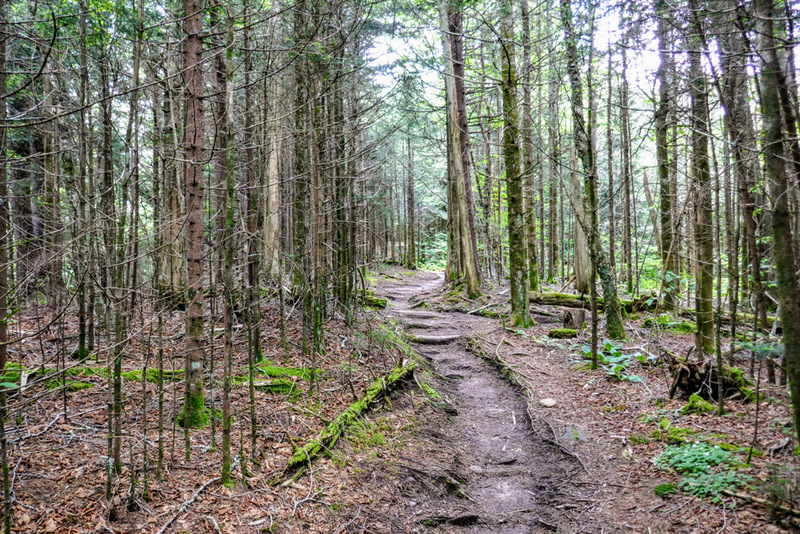 Mile 5.1 – The Clingmans Dome Bypass Trail ends at a Y-junction with the Appalachian Trail. Turn right heading east towards Clingmans Dome. 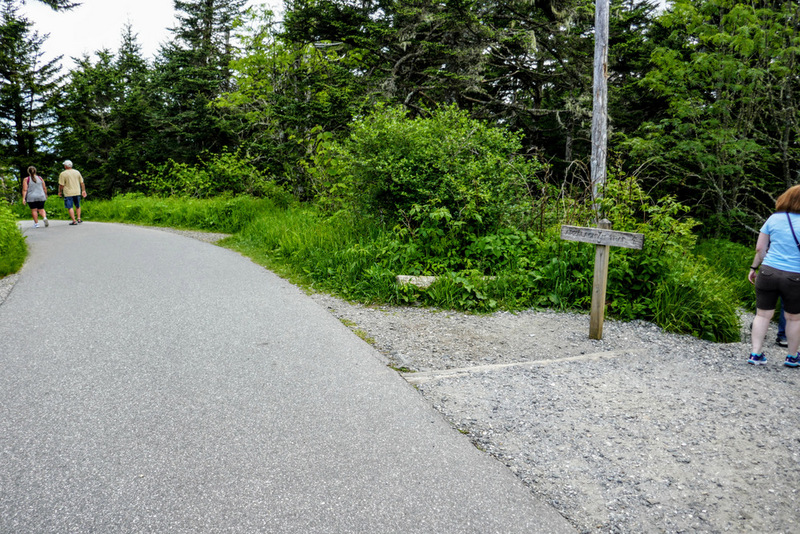 Mile 5.3 – T-junction with a short connector to the Clingmans Dome Trail. Mile 5.4 – T-junction with the connector to Clingmans Dome observation tower. 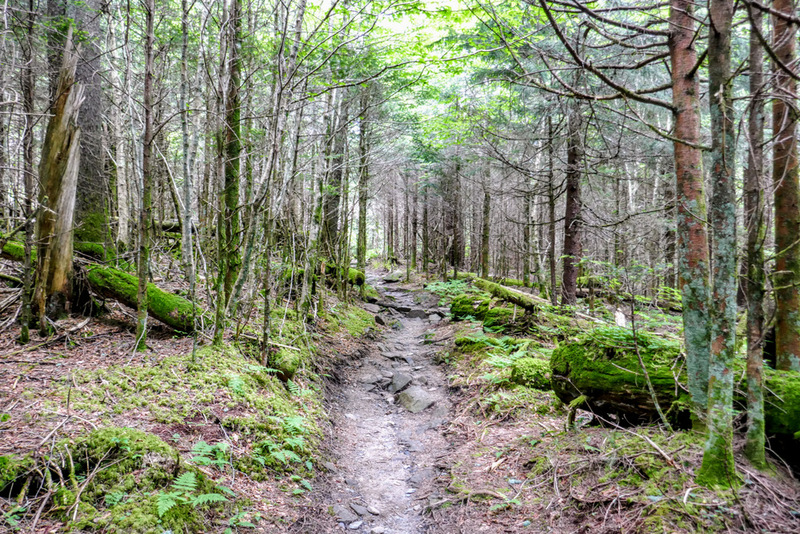 Follow the Appalachian Trail and Mountains-to-Sea Trail back to the Fork Ridge Trailhead. 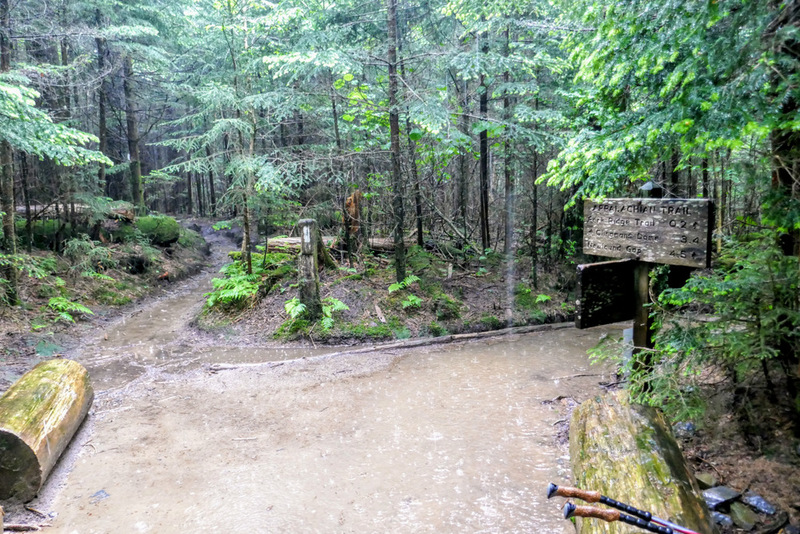 Mile 9.0 – Hike ends at the Fork Ridge Trailhead.